World Vladimir Putin Russia St. Petersburg History U.S.S.R.
Great cities rarely change their names. It is true, as the old song avers, that old New York was once New Amsterdam, but the change was precipitated by an English takeover of the Dutch colony. To keep the old name would have been like asking a hotel not to change the bedsheets from the room’s previous occupant. Constantinople became Istanbul some time after the Ottomans claimed the city in 1453. Bombay became Mumbai; Saigon turned into Ho Chi Minh City. And yes, Hot Springs, New Mexico, became Truth or Consequences in 1950. But these are rare events. The greater the city, the more secure its name. London can only be London. Paris will always be Paris. And then there is St. Petersburg, which has had not two appellations but three, having changed its name twice, only to return many decades later to the original one, which it presently occupies like an old overcoat that no longer quite fits. The plight of its name, in many ways, encapsulates Russia’s tortured relationship with the West, a relationship as unsettled in our time as it has ever been. The name-changing began a century ago today, when on September 1, 1914, St. Petersburg became Petrograd. Nobody had conquered the city (nobody ever has). Instead, the Slavification was the product of shifting national feeling, an insularity that continues to radiate from Russia today. And while the original, European name has been returned, the celebration of European ideals that once marked St. Petersburg as Russia’s most avant-garde city resides only in the amber of the past. Oh, sure, there are Western boutiques along Nevsky Prospekt, the main thoroughfare that is like a dusty version of the Champs-Élysées. There are tourists from Helsinki (though not from Omaha), snapping pictures in the Hermitage while fierce, matronly docents hiss whenever someone gets too close to a Matisse or a Gauguin. But underneath, it is all Petrograd, not Petersburg. Peter the Great founded Sankt Peterburg as a “window into Europe” in 1703. He was educated during youthful travels through Western Europe, and loathed the Slavic, ligneous chaos of Moscow. His city was laid out and built by Italian and French architects, a city too mannered and rectilineal for Russia, a city that announced to Europe that Russia had finally emerged into resplendent modernity. The Romanov potentates resided for most of the next two centuries in the Winter Palace, the green-white-and-gold testament to their Western aspirations. French philosophers like Diderot consorted with Catherine the Great, while Russian explorers established outposts in California. And while much of Russia remained mired in medieval agrarianism, in Petersburg, at the Empire’s edge, Mendeleev discovered the periodic table and Tchaikovsky composed The Nutcracker. This was a nonsensical response to the hostilities with Germany, since the city’s name had Dutch origins, not German ones. More important, as Volkov notes, “turning the capital’s name into Petrograd made it the city of Peter the man, Peter the emperor, whereas at the time of its founding the city had been named for Saint Peter, its patron.” That adoration of Great Men, so crippling and childish, continues to this day. The name did not last. On January 26, 1924, the city was renamed Leningrad to commemorate the recently departed leader of the Bolsheviks. This second change removed the last of the European vestiges from the name of the most European of Russia’s cities. In the decades that followed, under Stalin and his successors, the Soviet Union drew further into itself, sustained by delusions of grandeur and bouts of fervid paranoia. I recall, from my childhood on Leningrad’s outskirts, a diet rich in clashing visions of nuclear holocaust and triumph over the corrupt, capitalist West. And we were a Hero City, so designated after surviving the brutal Wehrmacht siege universally known as the 900 Days. Stalin had essentially invited Hitler right to Russia’s doorstep, and his own delusional purges killed perhaps 30 million Russians, but none of that ever went mentioned. The socialist revolution could tolerate no such deviations from its destiny. In the summer of 1991, with the Soviet Union on life-support, the citizens of Leningrad were allowed to vote on whether to return the city to its original name. Most everyone seemed to like the idea, for the Russian soul is nothing if not nostalgic. The New York Times quoted a retired actor who supported the change: “It's the natural name. We're all battling against what was ugly, what was unnatural these past 70 years." Yet for many Petersburgers, this seemed an auspicious sign that Petersburg was reclaiming its role as an intermediary between Russia and Europe, after having been overshadowed by cloistered, parochial Moscow. Equally promising was the elevation of an unknown but loyal KGB functionary — one Vladimir Putin — to the Kremlin after Boris Yeltsin proved too besotted with vodka to govern anything more complex than a bar menu. 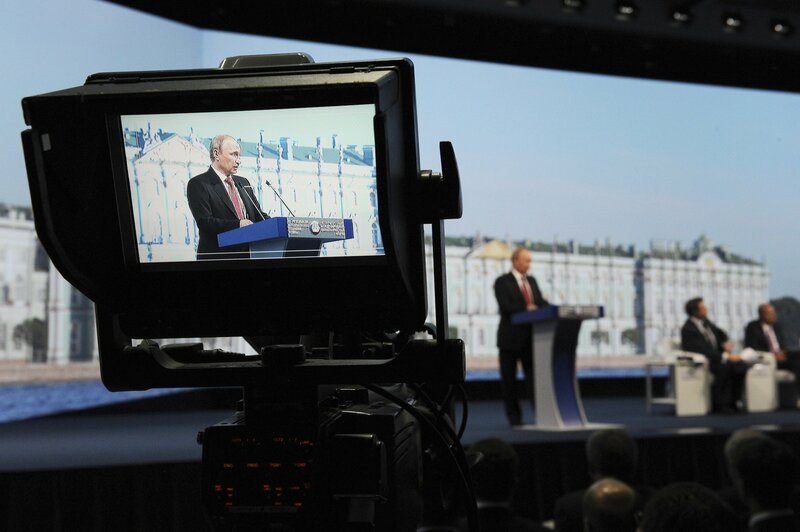 Much as George W. Bush brought Texas to the White House, Putin seemed to stock the Kremlin with Petersburg loyalists. Power thus returned to the banks of the Neva River, where it had been wielded by Peter and Catherine, where it always belonged. But history is never so pretty. Putin has done his best to restore the misplaced but politically useful nationalism that turned St. Petersburg, pointlessly, into Petrograd. I wouldn’t be surprise to learn he voted against the 1991 referendum, so deep is his animosity towards the West, his inferiority complex about Russia’s role in the world. To his credit, however, he has managed to harness Russian nostalgia, cleverly recognizing that what many Russians crave is not the difficult path back to Europe, but the far easier return to the USSR. Putin has thus declared that Russia will renounce that which is European when it is expedient to do so. Free press and gay rights have no traction on Red Square. Often, neither does the freedom to simply demonstrate, unless you happen to be a pro-regime goon with a predilection for fascism and fisticuffs. Russia will help drunken separatists in eastern Ukraine shoot down civilian jets. It will sell arms to Syria. It will not heed Angela Merkel, or John Kerry. It will not be lectured about civil society and the rule of law. In 1918, Meriel Buchanan, daughter of the British ambassador to Russia, Sir George Buchanan, published a book called Petrograd, The City of Trouble: 1914-1918. Buchanan writes of the desperation of 1917, with the war going poorly and the masses at home deeply discontent. “There was nothing bad or vile enough that was not insinuated,” she writes of the ailing capital. “Evil influences were no doubt at work,” many believed, on the cusp of bringing Mother Russia to ruin. So be it. This is a storyline the Kremlin loves, deploying it against Jews, Americans, Chechens, whatever foe may be at hand. Since World War II, most of those foes have either been invented or exaggerated, but that matters little. Only the historical narrative, the apparent tragedy with a triumphant fifth act, counts. Everyone is against Russia, and yet Russia, alone, will prevail. For that the people must sacrifice, do as they are told, never question the man who looks down in stony silence from the Kremlin’s red ramparts. To rename a city of millions is to alter history with one slash of the sword. When St. Petersburg became Petrograd, it turned away from Europe, on whose very edge it stood like a child eager to be let into a room of adults. Then it became Leningrad, withdrawing further into itself. The return of the original name in 1991, after 77 years, was only a cosmetic change that does nothing to scrub away the Soviet sentiment that lies underneath, and which Putin seems to mine with stunning efficacy. Petersburg has returned. And yet Petrograd remains, looking more like Leningrad with each passing year of Putin's reign.